Dickinson, Frost, Browning, Rossetti, Keats, Shelley, Shakespeare, Byron, Wordsworth and many more. 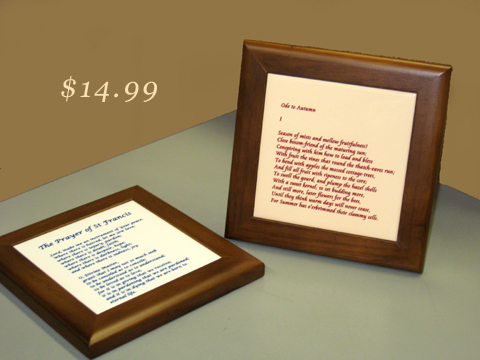 The Lord's Prayer, The Serenity Prayer, The Peace Prayer of St Francis of Assisi and more. The 23rd Psalm, Micah 6:8, The 121st Psalm, The Good Shepherd, The Parable of the Good Samaritan and more.